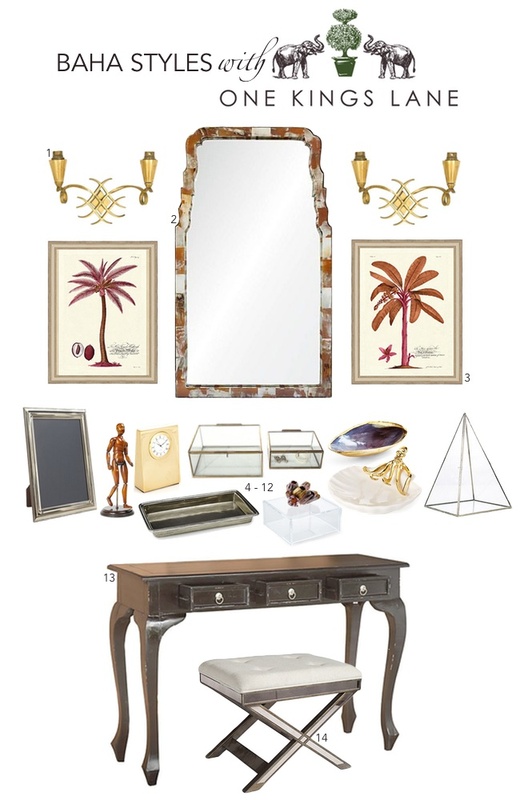 One Kings Lane recently asked me to select a statement mirror from their website, using such as an inspirational starting point to style a vanity. A humbling request in of itself. Even more so because I often find myself spending hours pouring over the purveyor’s website in search of one-of-a-kind interior design finds. Cliché as it may sound I’m currently enamored with the colour orange, perhaps because around this time of year it is in full bloom and ripe for the picking in the islands. Seen in the fire burst of the poinciana tree, the ripened skin of a mango, and usually in the sunrise and sunset that mark the beginning and end of our days. Taking my colour inspiration I set out to design a corner of a room which would express my love for a well dressed tablescape and serve to reflect the idea that a room’s objects are always open to interpretation, rarely serving a single purpose. 1. A pair of double arm wall sconces in a pattern similar to of the one seen on a pineapple. 2. My inspirational starting point, an oversized mirror embellished with varying depths of colour. 3. A pink palm print set which compliments the hues bordering the mirror. 5. Incorporating hints of history and nostalgia to my tablescape around the neck of this antique model I would hang an assortment of my necklaces. On his extended arm, perhaps a bracelet or two. 6. To my husband Christopher’s relief, a desktop clock given I am always on island-time. 7. A pewter vanity tray to hold my perfumes, including my custom wedding scent. 8. Brass trim display boxes in which I would place my favourite beach finds alongside my most cherished statement jewels. 9. An acrylic box topped with barnacles, a sure nod to island life and one that melds the pink, purple and orange hues seen in the palm prints suspended above. 10. Yet another nod, this rose gold-plated oyster shell in which I would place stud earrings. 11. An octopus to keep watch over my sea of bracelets held in this clam plate. 12. A pyramid display case in which I would carefully place a conch-shell. It’s iridescent lip reflecting the colours seen on and above the table’s horizon. 13. This console table with its cabriole legs would bring a touch of classic to the room. In the three drawers the real arsenal, in the form of skin-care and make-up, will be placed. 14. A mirrored vanity stool. Although I doubt it would ever arrive to the the island in one piece. Especially after traveling by truck, plane, boat, and possibly even a smaller boat.